Cabo San Lucas is a short, 60-minute drive south of Todos Santos on Highway 19 and if you’ve ever been there, or even seen pictures of the city, you’re no doubt familiar with the famous Los Arcos (the Arches) that stand majestically at the tip of the Baja Peninsula on a finger of rock and sand known as Land’s End. 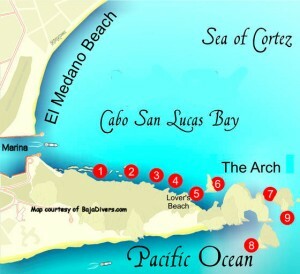 This area is easily accessible by the many pangas and glass bottom boats that fill the Cabo marina and the mini-peninsula includes a sea lion colony and the famous Lovers Beach – a wide strip of sand that connects the Sea of Cortez and the Pacific Ocean. These two attractions alone make a trip to Land’s End a rewarding day trip, but if you’re a scuba diver, there are many more reasons to visit. 1. North Wall (15’ – 120’) is just outside the entrance to the Cabo marina. The shallows provide a smooth, sandy bottom perfect for diving classes but it gradually slopes off to 30′ where a wall dramatically drops hundreds of feet. Along the top of the wall you’ll find a large variety of marine life, including large coral heads, moray eels, puffers, tropical fish, octopus, hermit crabs, urchins, cone-head crabs and lobster. Farther down, you might see diamond and bulls-eye rays, eagle rays, mantas, sea turtles, an occasional whale shark or even the local white tip shark. 2. Sand Falls (15’-140’) was originally discovered by Jacques Costeau forty years ago and is situated on the edge of a deep submarine canyon. The falls start at about 90′ where sand gathers on the slope and eventually begins to slide under its own weight descending down to depths of up to 400′. Sand Falls is home to more than 300 species of marine life including octopus, schools of barracuda, rays and large fish coming in from the nearby deeper water. This is an excellent night dive sight. 3. Pelican Rock (20’-120’) is the perfect dive site and it’s an excellent choice for every level of diver, from beginner/resort diver to the more experienced. The shallows provide a smooth, sandy bottom in 15′ of water – perfect for dive classes. More experienced divers can drop down the face of the wall to 90′ and view the deep hidden pinnacle rocks. The depth creates almost perfect visibility and provides a glimpse of pristine fan corals and gorgonians on the underwater edge of the Cabo San Lucas Bay. Intermediate divers may want to stop at 50′ to 70′ and explore the base of the main pinnacle. This area is home to the same variety of marine life found at Sand Falls and the North Wall: Mexican parrot fish, porcupine fish, box puffers, Mexican clown fish, octopus, goat fish, surgeon fish, yellow snapper, buttercups, and many others. In addition, it’s not uncommon to see eagle rays, mantas, sea lions, white-tip reef sharks, sea turtles and an occasional whale shark lurking along the face of the deep wall. 4. Middle Wall (100’) is a deep site for advanced divers only. This area provides a look at pristine fan corals, gorgonians and large schools of fish deep along the wall. It is common to see large grouper, sea bass, yellow snapper and countless other species here. 5. South Wall (90’-120’) is deep and only for advanced divers. 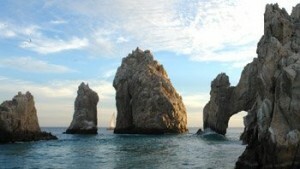 The depth provides a look at the amazing geology of the Cabo San Lucas Bay. Very similar to the Middle Wall, it is home to large amounts of marine life and pristine coral formations. 6. Neptune’s Finger (30’-120’) is located off the edge of Lover’s Beach and is a great spot for exploring the deep ridge along the edge of the Cabo San Lucas Bay. The ridge starts at about 80′ and drops down to more than 600′. This is a good location for watching passing schools of manta rays, exploring small Sand Falls and enjoying the macro life present in the shallows along the rocks that create the finger. Countless species of life can be witnessed here. This is a deep dive, for advanced divers only. 7. Sea Lion Colony (20’-70’) is a dive that gives even the novice diver an excellent opportunity to join and observe the sea lions in their own habitat. The sea lions are playful and active creatures. The females are very friendly and often seem to show off, swimming in circles and spirals in front of divers while the larger males keep more to themselves. You’ll also see lots of other marine life, including eels, angelfish, parrotfish, garden eels, spotted box fish puffers, giant hawkfish and barberfish. You might also see tuna, barracuda, herring, turtles and schools of jack. 8. Shipwreck (50’-70’) is a small shipwreck that gets smaller every year due to erosion and the constant motion of the Pacific current. This boat used to bring people back and forth from Mazatlan to Cabo San Lucas. This is a newer dive site and it’s located outside the bay in the Pacific Ocean. Because the dive sites are so close, many Cabo dive operators run several trips per day to Land’s End, so you don’t even have to get up early to enjoy an incredible dive and still make it back to Todos Santos by dinner time. 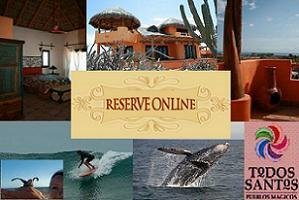 For a complete list of dive operators serving this and other Baja dive destinations, visit http://www.bajadivers.com/ and click on the Dive in Baja link.